Bbased in the Asian side of Istanbul, Fenerbahçe have long ago reached the point of being considered a European great, proof of which is that in 2006, just before celebrating the 100th anniversary of their founding, they were the first Turkish club that got invited to participate in a G-14 (the predecessor of today's European Club Association) conference, an invitation reserved only for top, on and off the field, European clubs. 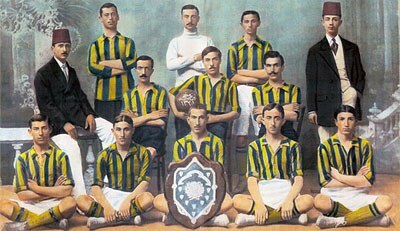 Fenerbahçe players and officials posing in 1912. Fenerbahçe Spor Kulübü (Sports Club; so it is in fact incorrect to refer to this club as Fenerbahce FC in English) were founded in 1907 but had to stay off the radar for about a year, since back then it was seriously frowned upon by the Ottoman authorities to be involved in a sport that was considered an “import” of the British who lived in Istanbul. Fenerbahçe is the name of a neighbourhood on the Asian side of the Turkish megalopolis, which the club have called home since the first day of their existence. “Fener” comes from ancient Greek “fanári”, “bahçe” is Turkish for “garden”, and the name of the neighborhood actually means “the garden of the lighthouse”, since it was exactly a lighthouse that used to stick out in that coastal part of Asian Istanbul. Sarı Kanaryalar, “The Yellow Canaries”, as the team are affectionately called, were the first winners of the Turkish national league in 1959. Ever since then, they have lifted Turkey's “heaviest” trophy 18 more times, winning six Turkish Cup titles as well along the way. Fenerbahçe have been very consistent in winning titles since the beginning of the professional era in Turkey, winning three or – more usually – four Championships each decade, with the exception of the nineties, when they finished top only at the end of the 1995-96 season. It goes without saying that alongside city rivals Galatasaray and Beşiktaş they are the three clubs that have never been relegated from the top Turkish flight. Their biggest rivalry is against Galatasaray, being the yang to their “European” counterpart's yin, kind of completing each other, and always giving one another an extra motive to keep improving, keep pushing for more successes, more titles, more fame and higher prestige. At international level, Fenerbahçe “touched” a UEFA competition final in 2013. They reached the semifinals of the Europa League, but despite beating Benfica 1-0 at home, they saw their Portuguese rivals make it through with a 3-1 win in Lisbon. Five years earlier they had reached the quarterfinals of the Champions League, in their best season in Europe's biggest club competition. It was Chelsea who shattered their dream that time. Their 2-1 home win proved just not enough, losing 2-0 in London. Müjdat Yetkiner spent his entire career at Fenerbahçe, and wore their jersey more times than any other player in the club's history, from 1980 to 1995. Zeki Rıza Sporel, a legendary figure of Fener's early ages, from 1915 to 1934, has scored more goals wearing their jersey than anyone else. Aykut Kocaman is the club's top goalscorer in the professional era, having played for them from 1988 to 1996. All three are real legends at Fenerbahçe, but even so, none of them comes even close to getting compared with the ultimate Fener legend, Lefter Küçükandonyadis. 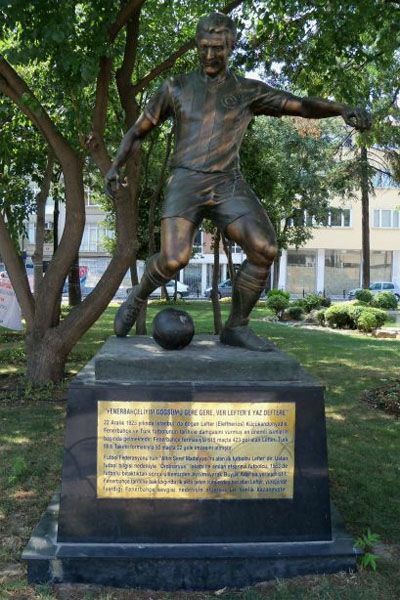 The statue of Lefter Küçükandonyadis, a few dozen meters from Fener's stadium. Λευτέρης Αντωνιάδης, (Leftéris Antoniádis, he was of Greek descent. “Küçük” is Turkish for “small, little”. He was just 1.69 tall), didn't start his career at Fenerbahçe, and he did move to Italy and France after his first four seasons with the Istanbul club, but he did play a total of 15 years for them, scoring hundreds of goals, and his caliber in the club's history is such that it's his statue that someone can see at a small distance from the Şükrü Saracoğlu Stadium. As for the club's biggest non-player figure, the fact that their stadium has been called “Şükrü Saracoğlu” since 1998, speaks volumes of the importance that former Fener president (and Turkey's 6th Prime Minister) holds at the club. Mehmet Şükrü Saracoğlu was Fenerbahçe's president from 1934 to 1950, retaining the title even during the four years (1942-1946) he served as Turkey's Prime Minister. Strong on and off the field, Fenerbahçe are surely destined to remain a Turkish and a European great, adding a little bit of Asian touch to the “Old Continent's” football elite. Fenerbahçe's official website describes the club's emblem in perfect detail: “The white section which includes the writing 'Fenerbahçe Spor Kulübü 1907' represents purity and open heartedness, the red section represents love and attachment to the club and symbolizes the Turkish flag. The yellow middle section symbolizes admiration and envy (of other clubs), while the navy symbolizes nobility. The 'oak acorn' leaf which rises from the navy and yellow section shows the power of Fenerbahçe. The green colour of the leaf shows the success of Fenerbahçe which is imperative”. Three stars are added to the emblem of the club on the team's jersey, with each star corresponding to five Championship titles won. Fener have 19, so sooner or later a fourth star will be added.